If you’ve ever had the misfortune to lose your luggage, you’ll know how annoying it can be. The chances are that it will affect you at some point if you’re a frequent flyer, with as many as 23 million bags being lost each year. Now, you could simply wait for the airline to get on the case but with such a logistical nightmare to deal with, this frequently takes quite a while. However, with a small GPS tracking device from Bluetrack called the Prime 1300 you can track your bag in real time from your smartphone or tablet. This could really give you piece of mind if you have important luggage. The tracker costs round £85 and with a battery life of around ten days when in your case, it gives you a pretty good chance of finding your case. It also has a battery save mode, which transmits daily signals for as long as twelve months. Considering the fact the around 5% of all cases lost are never reunited with their owners, this could be a very shrewd investment. We expect our cases to turn up at our destination; however the statistics do prove that this is not always the case. 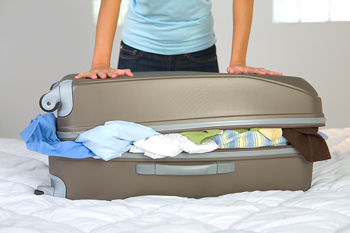 With a GPS tracker you can be sure that you and your luggage won’t be separated permanently. Of course, lost luggage is just one of the things we need to worry about when we go on holiday. Losing possessions, theft and accidents can all put a dampener on our holidays. That’s why you should always have the right travel insurance when you go abroad. That way, should anything unexpected happen; at least you know you are protected.